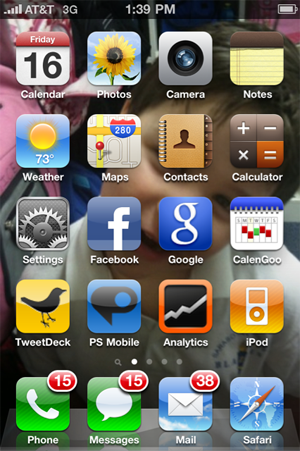 When I got my first iPhone, the 3GS, I had problems at first where my face touching the screen would hang up on people. After a few weeks this stopped. However, I would by accident mute people or put them on hold all the time. Sometimes I could touch the top sleep button and the phone would remain on, other times it hung up on people; I couldn’t use that option with confidence…it was still a great phone. I noticed immediately that my face was hanging up on everyone. I don’t overly smush the phone with my face. I hold it like I do any other phone. I now have to have it on speaker and hold it away from my face and people say it doesn’t sound as good. The hangs are crazy! I bought a screen protector at AT&T Wireless and a ifrogz case. AT&T said the screen protector didn’t fit with the case, so I left with just the case. I read on BestBuy.com that many people can’t get the screen protector to work with any case…I assumed I would have to wait for a better case to come out. I think the over sensitivity issue compared to my last phone may be because I don’t have a screen protector, so I bought one and I am going to cut it to fit and see if things get better. I will let you know! Did your screen sensitivity issues get better? I’ve had mine replaced and the new phone still has issues!